Are we going to pretend babies aren't being carried awkwardly down the VMAs red carpet? See the Red Carpet post for all the best looks from the VMAs. The 2018 MTV Video Music Awards have kicked off in style and already we are a little confused. We think there is a babysitter crisis in Hollywood. Quietly awaiting the VMAs red carpet, we were wondering what type of accessories might feature this year. Would there be some statement earrings? Perhaps some royal-inspired hats? NOPE. The newest red carpet accessory at the VMAs is literally taking your baby in an outfit matching dads. DJ Khaled turned up to the VMAs with his two-year-old son Asahd Tuck Khaled on his hip, looking incredibly adorable in an outfit matching mum and dads. Nicole Tuck, DJ Khaled and Asahd Khaled. Image: Getty. 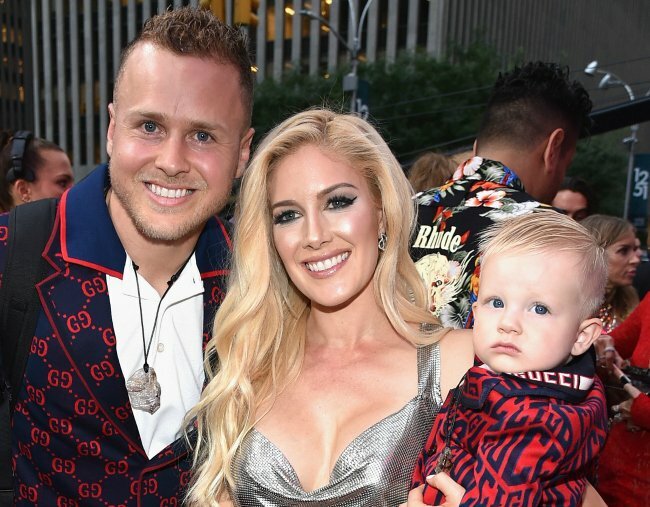 Shortly after, Heidi and Spencer Pratt from the vintage reality television show The Hills arrived with their son Gunner, who was wearing a mini version of his dads red and black blazer. Spencer Pratt, son Gunner Pratt and Heidi Pratt. Image: Getty. Then of course, Cardi B tried to jump on the trend, but it turns out her baby was just an award wrapped up like a baby. Nice try, though. IS DAT A BABY? Image: Getty. This is completely adorable, and there is no doubt that these babies will have a better night tonight than we ever will. We just hope the babysitters of Hollywood aren&apos;t having too tough of an evening. And that the babies aren&apos;t disappointed by a lack of lolly bags.